There are two ways to add additional target scores: (1) create a custom target score and (2) select the target score of an existing school or institution. To create a custom target score, click on the link to Add a target score. Enter a description for the target and enter a value for the score. The score must be a number between 50 and 100. If you want to make the new target your current target score, check the Is current target? checkbox. Click the Add Target Score Button to add the new target to your list. To add target scores based on a particular institution, click the list Modify list link. This will open a window allowing you to search for schools by location or name. To search for schools by location, enter a ZIP code and choose a desired search radius. Click the Update list button to see the schools and target scores that meet your search criteria. 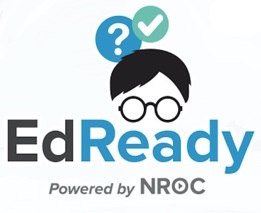 To only show schools that you are ready for based on your current EdReady score, check the box labeled Show only schools I'm ready for. This will limit your search results to schools that have target scores at or below your current EdReady score. To search for schools by name, begin typing the name of the school in the text box and select the desired school as it appears in the list. Click the Add to list button to add this school to the list on the right. The distance shown is the distance from your home zip code, which you entered when registering. If that isn’t the correct zip code, you can always change it via the My Account page. To select a school, select the checkbox in front of the school’s name, which will add these schools to the list of schools you’re interested in attending. If you are interested in more information on a school, clicking on its name or the (i) icon will open an information window with some data about the school and some additional useful links. Click the school name to go to the school’s website (in a new tab or window). I hit my target score but did not get to study all the material on my study path. How is this possible?